Why only Remlers? 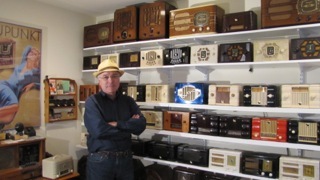 When I first got into the hobby, I was reading everything I could find on radio collecting. I came across several collectors who specialized in certain brands. 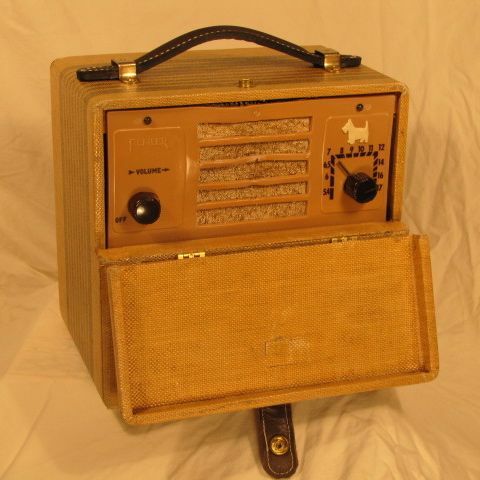 Ron Ramirez has this Philco specialization for instance, and there are guys who collect only Scotts or Zeniths, etc. 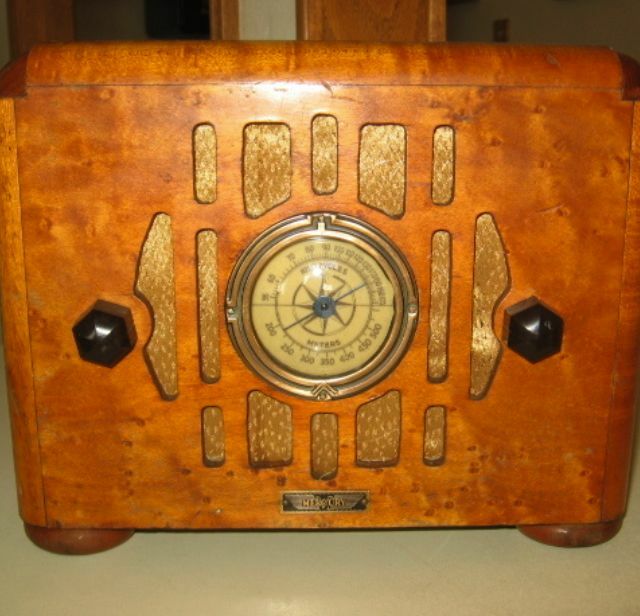 That sort of made sense to me, to get into one particular brand and understand something about the company as well as admire the radios themselves. Also, like a lot of new collectors, I was amassing way too many radios and needed to begin employing some kind of selective criteria. If I hadn’t, I’d have had to move the wife and kids out long ago to make room. I pretty much just figured ‘why not the hometown brand’? Luckily, Remler was a relatively small outfit, so the wife and kids could stay. Collecting Remlers also has a lot to do with my love of San Francisco and its’ history. The Remler factory is a couple miles from my house; it has only recently been renovated into condos. Further, the company represents SF back when there was real manufacturing going on here. Steve Kushman tells a great story about an accident with a vacuum cleaner causing the family Remler to crash and break, and his Dad driving over to the Bryant Street factory to buy a new case. Cool. Is th ere anything unique about Remlers that makes them collectable? To people outside of the Bay Area, maybe Remler is not such a unique brand. The ‘Fala’ Scottie dog likeness on a lot of their sets is recognizable, but it wasn’t used on all their products. 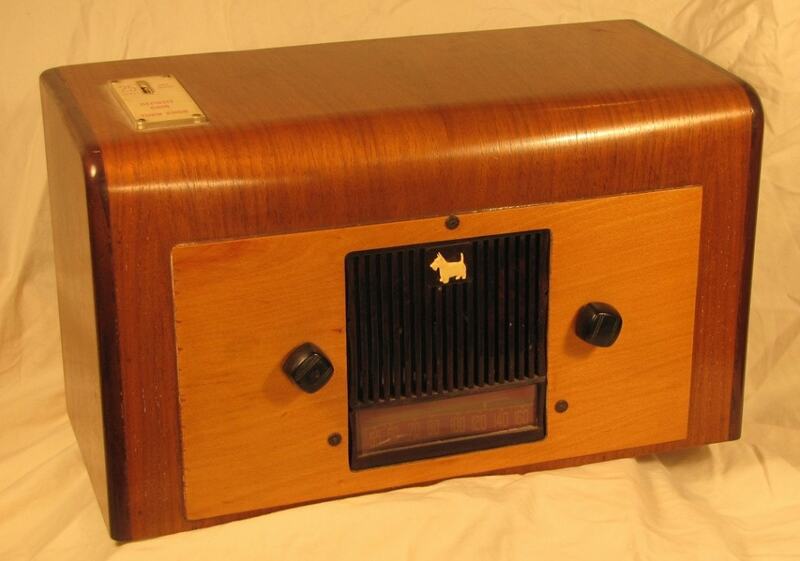 Besides, RCA had ‘Nipper’ on many of its’ sets. Beyond the ‘Hometown ‘ connection, the company is interesting to me because of its’ marketing ideas; I can’t think of another radio manufacturer who made radios under multiple brand names without being contracted by some retailer to do so. A lot of radio companies made ‘Airlines’ and Firestones’ for instance, but those brands were contracted for by retailers wanting ‘house brand’ names. 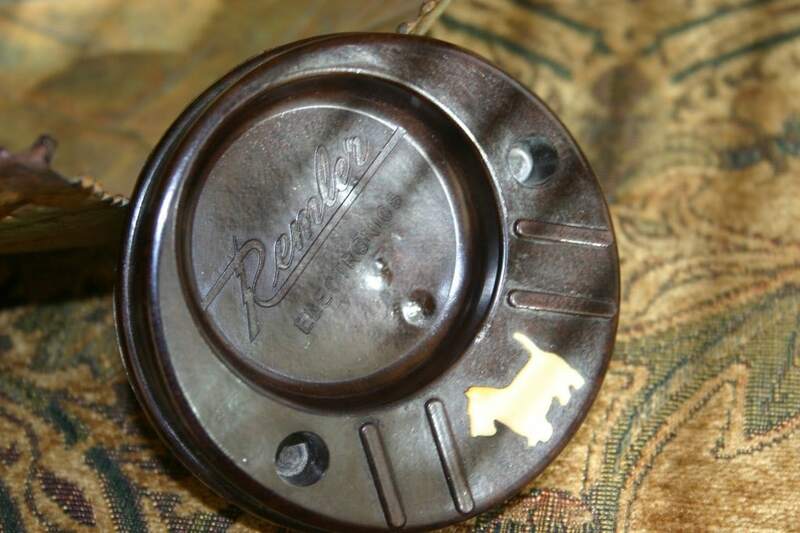 Remler seems to have varied their own brand names as well as their product lines within those brands. Who else did that? Maybe this is a case of a relatively small manufacturer trying different ways to move product and compete with outfits with much bigger ad budgets. On the technical side, I don’t think Remler employed much in the way of radical circuitry designs, though some of their portables employed unusually-wired ‘dual’ chassis, accommodating AC or DC power in a way other manufacturers didn’t. When did you begin this Remler specialization? Soon after I began collecting. Maybe fifteen years or so ago. How many are in the collection? Probably 100 – 120 Remlers, counting some that are differentiated only by color of case. Some have different brand names, like Norco and Tot, and some with more obscure names like Robin, Heyco and Grayson (from the names of the owners of the company, Thomas ‘Gray’ and Ernest Danielson). I also have Remler intercom systems, ashtrays, letter openers, telephone earpieces, phone handsets, a gearshift knob and some military gear. 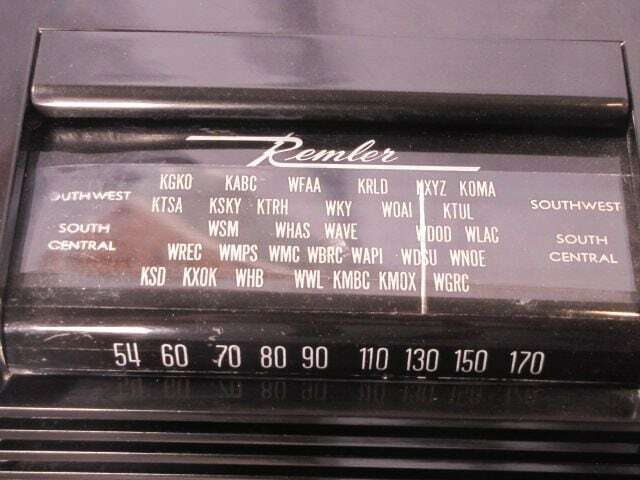 Remler had invested in plastic molding machinery and evidently shopped that service out to other manufacturers, even outside the radio industry. I have a table lighter with a Remler-made plastic case. I have two Sonora radios with Remler-made cases. I also have another couple dozen non-Remler radios that I just love and can’t let go of. Zeniths, Crosleys, Motorolas, etc. Do you have all Do you have all Remler’s models? Not by a long shot; I have plenty of goals to shoot for. 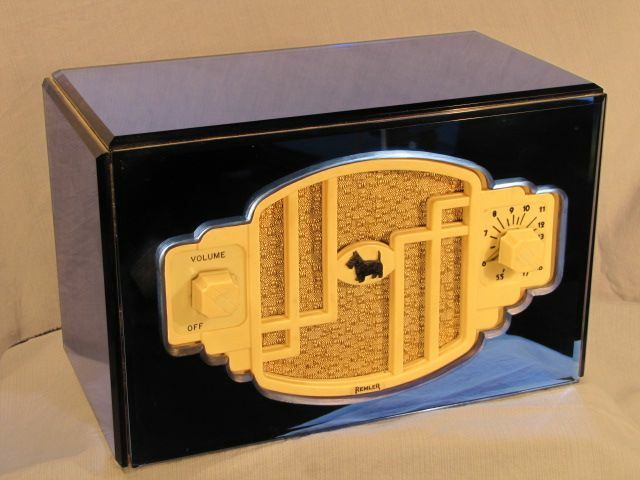 Remler was in business from 1918 until sometime in the late 1960’s, though they’d apparently exited the consumer radio business sometime before 1950 as I can find no model more recent than about 1947-8. 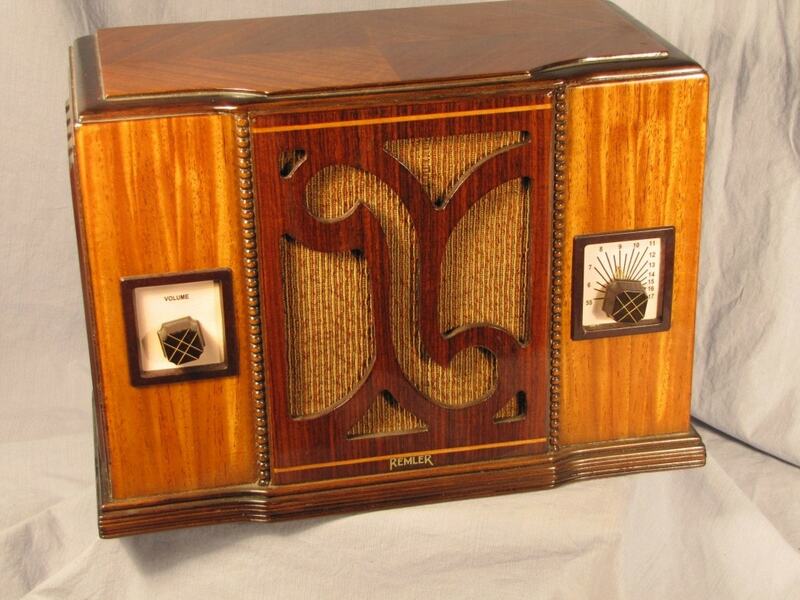 Still, that’s a long time to make radios and there are always more variants popping up. I’m always on the hunt for a model 73 and 88, 89 and a few others. I don’t yet own one of their big consoles, though I’ve turned down some high-boy models simply for lack of display room. There are colors of their mirrored cases that I’d love to have. I thought Norco was a brand name from the Northwest? It was. That company went out of business by the very early 1930’s and Remler seems to have registered the name for an ‘economy’ line of its’ products sometime around 1936. I have Norco’s from about that time up to about WW II. 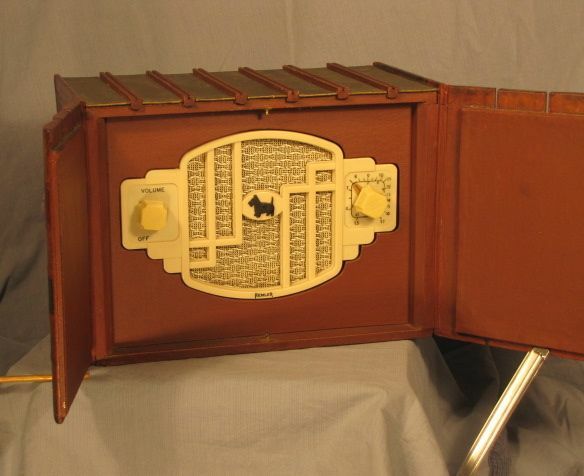 Why Remler also produced radios under the names ‘Tot’ and others I can only speculate. One of my ‘Tot’ radios has ‘Standford’ identified as the manufacturer on the chassis label, though they’re clearly Remlers. Another one of our CHRS members has a Remler with ‘Standford’ identified on the chassis. 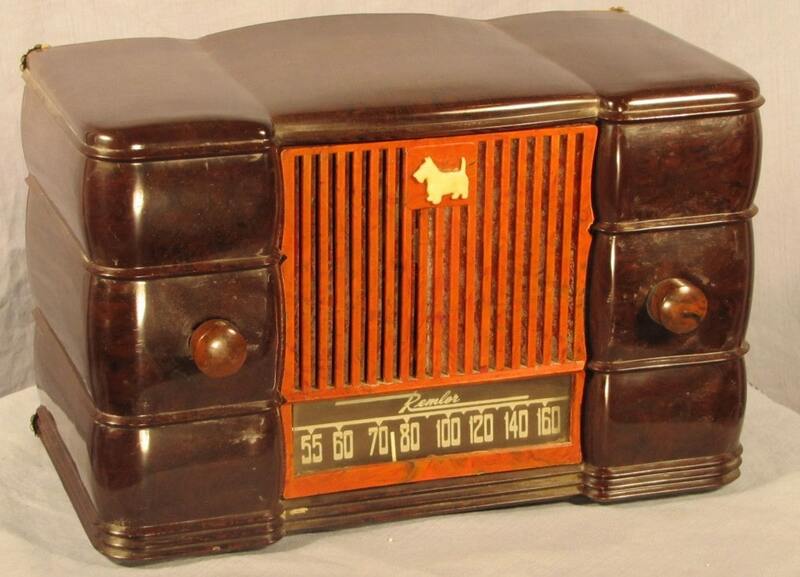 Likely there were retailers who wanted radios with their own ‘brand’ on them and had Remler manufacturer the radios. That might explain my ‘Heyco’ Remler, maybe for Hales’ Department Store, though I’m not familiar with any retailer using the ‘Tot’ name. 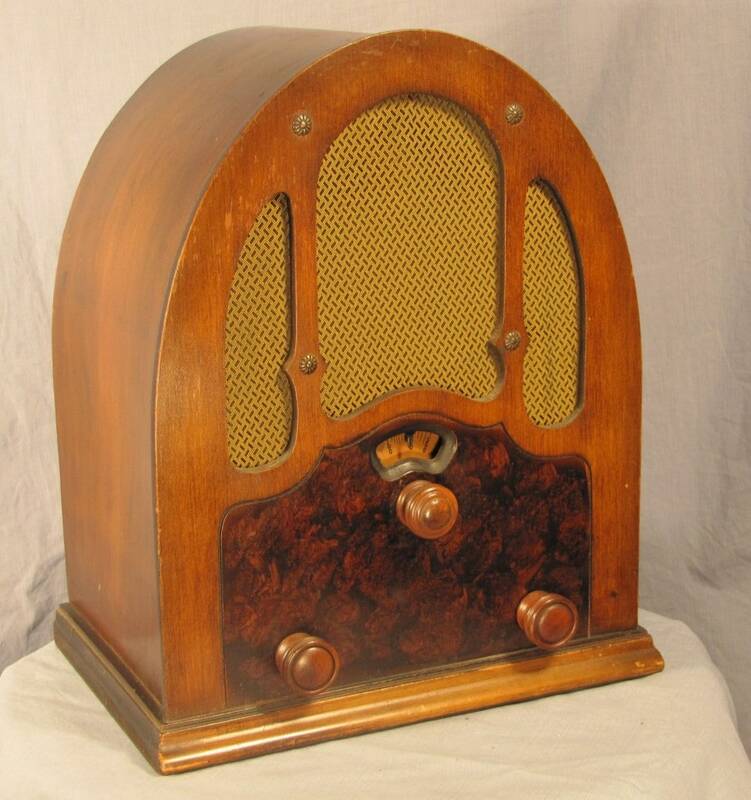 The name ‘Remler’ reportedly came from Elmer T. Cunningham, the company’s founder, arriving at the company’s name simply using his first name spelled backwards with an added ‘R’ for ‘radio’. Come across any substantiation? None whatsoever, though I’ve found nothing to disprove it either. I have another theory to go along with that unsubstantiated theory. Cunningham had radio operations in Chicago as well as SF. In my search for Remler products, I came across a popular upscale restaurant in Chicago located just five blocks from Cunningham’s Chicago plant. The restaurant’s name was “The Kuntz-Remmler Company” (two ‘m’s). Coincidence? Could be. Which came first? I don’t know. But where’s your sense of romance? Maybe Mrs. Cunningham was a Chicago girl and they loved the place! Maybe the name recalled the Windy City to her after Cunningham drug her out West! This calls for more research! What’s your favorite thing to find? Obscure items from Remler’s product line. Also prototypes; I have one or two sets that never made it to market but since the factory was here in town, these pieces sometimes made it into employees’ homes and thus into the ‘collector ecosystem’. Remler, being on the smaller end of the ‘mass producer’ scale, didn’t maintain a comprehensive catalog of their product line. The closest I’ve found to a catalog is a 1947 price list from a local electronics wholesaler. The ‘Norco’ line seems to have had the most products in it and ran for the longest time, but I know of at least two models of ‘Standford’ and two variants of ‘Tot’. Remler could also be cavalier about their system of model numbers. For instance, the popular 5500 series, with the upholstered-looking sides and slide rule dial, came in multiple color combinations, each with a four-digit model number with the last two digits identifying case color. However, the labels on the bottom of all of them were printed simply ‘5500’ and hand-written over the last two digits would be the two digit color code. Kind of homey of a mass producer of consumer products. I have several Remlers that appear in no repair directories, much less collectors’ books. I don’t collect the very early coffin-lid types(or the early kits marketed under the name ‘Best’) as they’d need so much display space. I admit to preferring the more modern designs of TRF’s and superhets. I do have four Remler ‘consolettes’; they look like side tables or small chests of drawers in various designs. They contain Remler’s Panchromatic superhet chassis which is one of the best AM receivers I’ve ever heard. Future for the collection? I’d like to put up a Remler website that would include as many products, from my collection and others, as can be found. This would help other collectors identify their Scotties. Of course, there’s more research on the history of the company to do. And more radios to hunt for. Got any favorites? The first Scottie I ever found, a model 5565 is sentimental favorite. 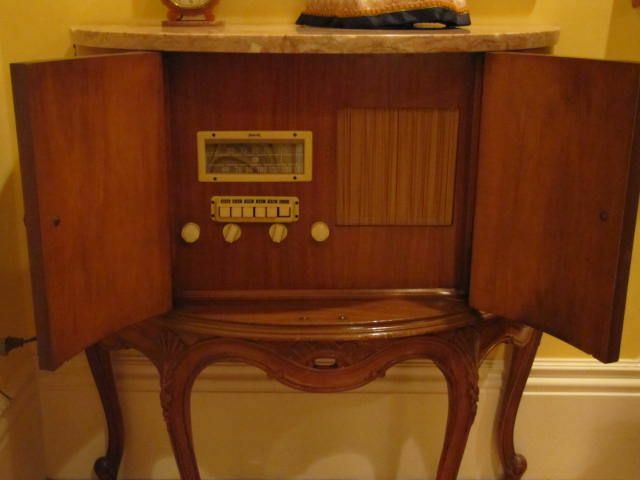 However, one of my prizes is the 470 consolette with the marble top; a great-sounding radio and a handsome piece of furniture. Any you don’t like? 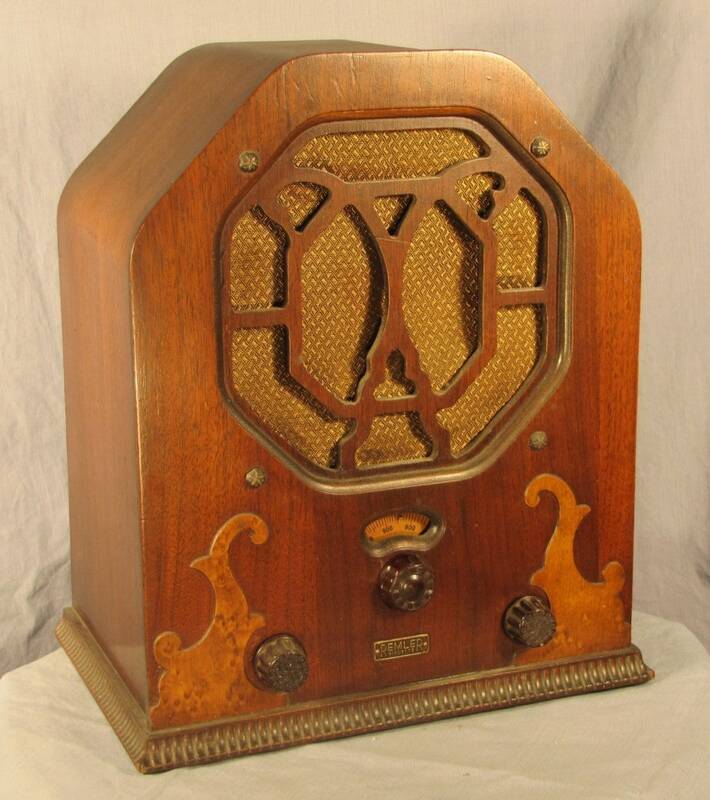 I have a model 58-28 radio/phono combo that’s one of the ugliest sets I’ve ever seen. It resides, unrestored, under my workbench. Not sure if it’ll ever see the light of day. Where did you find all these? At first, I found them almost equally in three places; eBay, swap meets and estate sales. Later, I was honored by my friend Jim Reveaux who offered to sell me his collection of Scotties. Later still, I was honored again by John Wentzel selling me his collection. A third selection came from another CHRS member wanting to find a good home for his wooden Remlers. Also, over the years, I’ve been very lucky to have established relationships with collectors in the Bay Area and elsewhere who let me know when they come across things I might want. Jerry Cantou was always looking out for me as well as Pat Kagi up in the North West. I try to look out for things they want for their collections as well. I still comb the internet and estate sales for them. I’ve been taking a liking to Remlers too. I now have a few of them, including a weird cathedral set (labelled Norco 4 on the back, but with 5 tubes and “Remler” on the front) that it looks like you have too. Also just today at HSC I picked up a late ’30’s Remler radio/phono/record cutter in $#@!-poor condition (left out in the rain, apparently). There isn’t much information on Remler on the web. Do you know any good way of identifying these obscure models? Thanks, and great web page! Jaime I have a Remler model 95 portable,10 tubes,5 on battery, 5 others on a/c , line up is 1N5,1A7,1N5,1H5,3Q5,12A8,12SK7,12SQ7,35L6 and 35Z5, ever seen or heard of one ? I have a couple of 95’s. With yours, that’s about five I’ve even heard exist so I don’t think there are many out there in the collector’s ecosphere. For the 95’s (and 93’s I think) Remler employed a ‘dual chassis’ wiring scheme from what I’m told by guys more knowledgeable than I about electronics; kind of an unusual way of accommodating both AC and DC power. 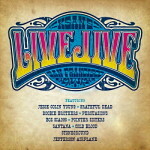 Great specialty collection! It seems like it almost must have been against some federal law to sell them here on the East Coast. ;<) I've almost never had the opportunity to buy one here in the SE. What I did not see mentioned were the Remler kit sets of the 20s… Their famous Infra+Dyne (Infradyne) I do have one of those in my collection… It will go on exhibit later this year. You you have any in your collection? Thanks for yours. I don’t have an Infradyne kit in my collection. I would love to see photos of yours. You can send them to the email address that’s in the ‘Contact Us’ ‘Officers and Directors’ on this website. I hope to put up a website this year with identifying photos and would love to include yours with full attribution of who it belongs to if that’s alright with you. 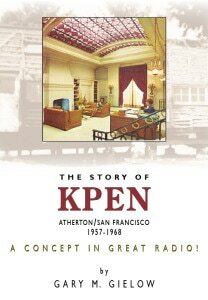 I live in Black Point ( Novato ) and can send photos of what I have plus lots of literature about radios plus knobs, switches, spindles, etc. I think we have been in touch already but if we haven’t, please email me directly at jaime@inlanguageradio.com and cc our President Steve Kushman at kushseal@flash.net. We can possibly arrange to sell off your collection. Thank you for reaching out to us. I have a Remler 5400/5410. It is the two tone brown color with beige knobs like the first picture on your website. Not sure which on it is, I have had stored in my closet for 40 years. It was plugged in about 35 years ago and worked. I was told not to plug it into modern day sockets as it might blow the tubes. Not wanting to ruin the radio I really don’t know if it stills works or not. Bottom line I am looking to sell the radio and am wanting suggestions how to test the radio and is there somewhere other than ebay to market it? I live in Sacramento. I am traveling at this writing but will call you the weekend of the 27th/28th December. Thank you. 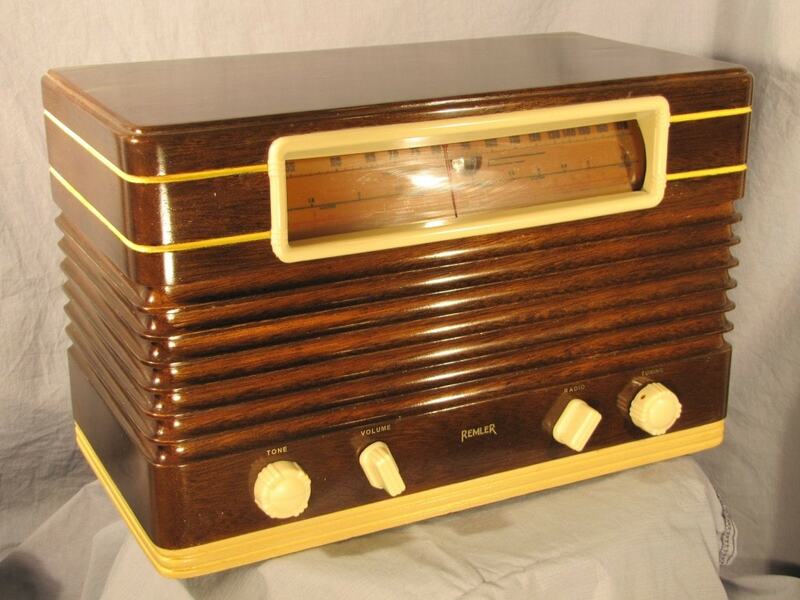 Jim: Estimating the value of any radio, particularly an unseen, untested one, is a wildly inaccurate exercise. The value is always dependent on how many people may want to own that particular radio at the particular time that you make it available to them (and how bad they want it). To add to those variables, the 21 was produced in several versions, some (including the ‘Menuette’) being in a case with angled shoulders, while others were in rounded cases. Variants are shown in the photo above (the top row of the small tombstones). If it helps at all, I’ve paid between $100-$200 for 21’s with working chassis and cases that needed little if any restoration. I hope that helps. Brenden: Finding a 471 at all is a rarity, much less one with all its’ original parts and especially the microphone. Is the mic marked ‘Remler’ anywhere on it? I found a Remler at a garage sale when I was in college in San Francisco back in 1979. It had the Bay Area stations listed. I sold it at a garage sale when I was in grad school to make ends meet, but regret it to this day. It had sentimental value as SF was where I met my wife. It was in excellent condition without the usual cracks, having been searching for one ever since to give to my wife as a anniversary present. There is a great looking one on EBay, but does not have Bay Area stations. I see the one on ebay. That’s a Model 6000. It is essentially the same as the MP5 that you found in the garage sale but was manufactured without the station call letters in order to broaden its’ sales outside of the Bay Area. Hang in there; the MP5’s (with the Bay Area call letters) come up on eBay every so often. I know it’s hard to find them without the heat stress cracks on the top, but they do show up. I have a black Remler with the white Scotty. I can find it online in the ivory case with black scotty but not mine. Its in pristine condition, no cracks anywhere not even around the recessed handle. It play very good. I was listening to it just last night. 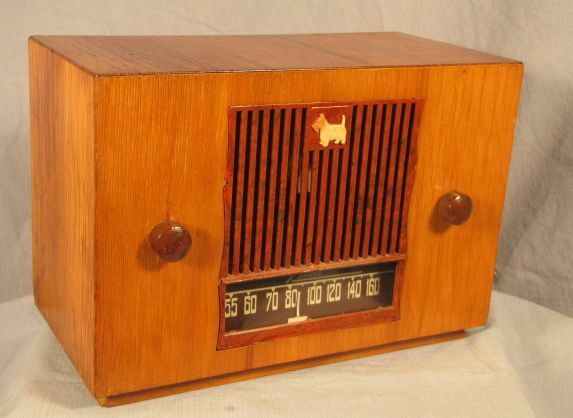 What is this radio worth? 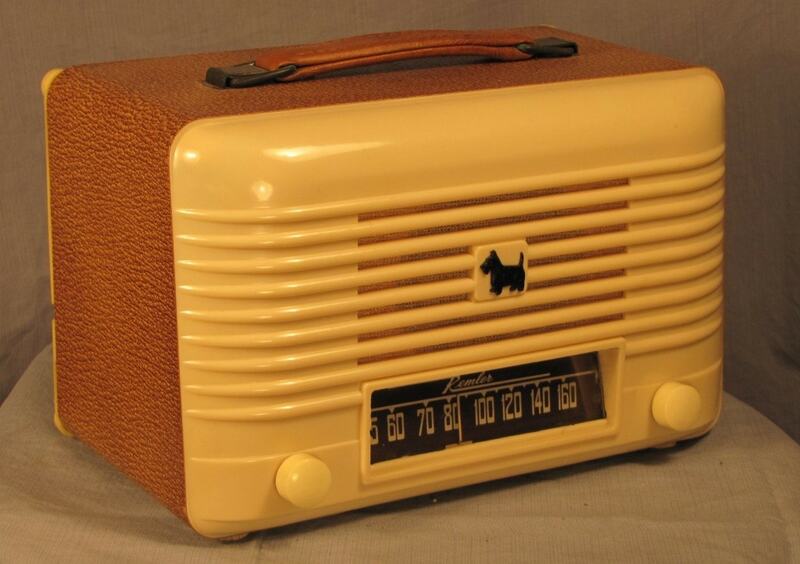 The cash value of any radio is determined by how many people want it at the time its’ offered for sale. Demand is everything. A black model MP-5-5-3 or 6000 (I don’t know which you have) without cracks could be worth $200-$300 if one hasn’t been up for sale recently. Conversely, if you put it up on ebay right after two have just been sold, you’ll get less. While the black models are more rare than the ivory ones, there are other factors that would affect it’s value to collectors. Is the dial ‘stationized’ (showing the call letters of radio stations) or does it just show the frequencies? If it is stationized, for what part of the country are the stations shown? Remler stationized radios for at least three regions of the country. One that’s stationized for California is more common for instance than one stationized for the East Coast. Does the AC cord retain the large fuse container or has it been replaced with a standard AC cord and plug? You can communicate with me directly (and send pics if you want) to jaime@chrs.net. The CHRS maintains a bulletin board where members can be alerted to items for sale. I will send you some pics. I love this radio, just curious about it. I bought it about 5 years ago because I couldn’t believe what good condition it was in and I adore the Scotty dogs and Westies. 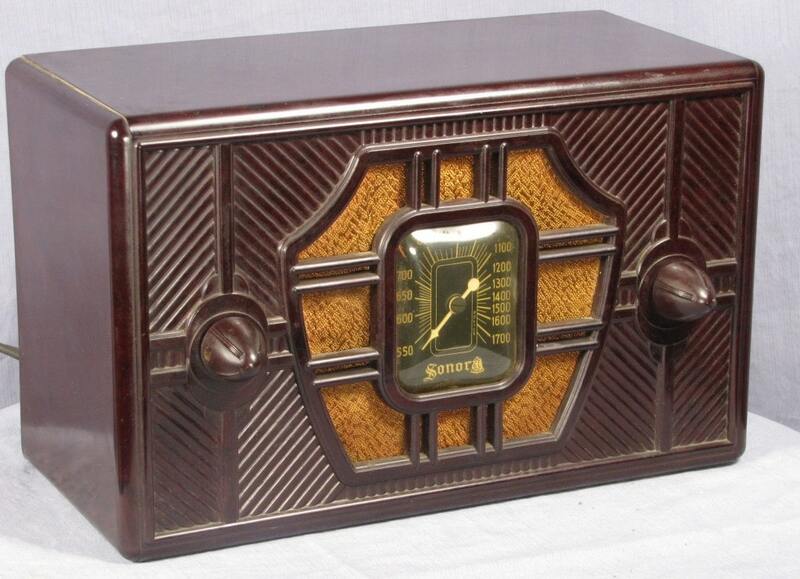 We collect all brands of old radios. I am partial to the little metal Arvin’s because of the unique colors. But this Remler is my favorite even over the expensive catalins we have. I feel your affection for it! You’re talking to the world’s biggest Remler fan. Enjoy.